Long time ago (approx. 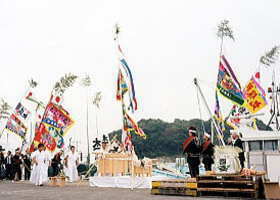 2,000 years ago), Yamatohime-no-Mikoto stopped by Shinojima while traveling through Ise Bay. 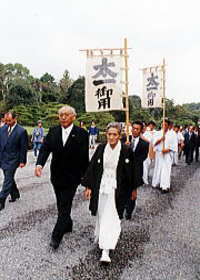 She loved this island very much and decided to make it a territory of Ise Shrine. to provide some food for Ise Shrine, especially bream. At the beach, fish are cleaned by taking off entrails and washing them with seawater and bamboo brush. 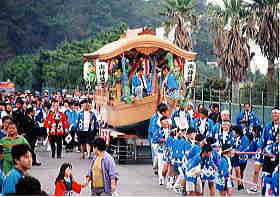 Then they are put into bamboo baskets and carried to the Choseijo, which is on the top of the hill. There they are stuffed 1.5 heaping handful of salt in their stomach, and piled up in the barrels, added seawater and put stone weights. On a fine day in one week, they are carried to the beach and washed by seawater again. Then dry them under the sunlight for two days. 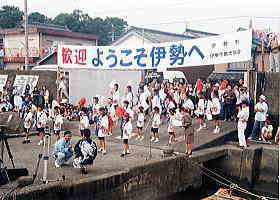 This is a Shinto ritual which has more than 1000 years of history in offering Ombe-bream to Ise Shrine(external link). 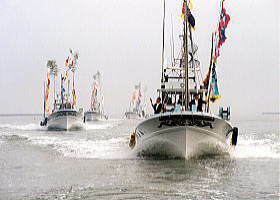 People take more than 500 dried salt breams every year, prepared by the members of Shinojima Fishermen Assoscation, to Ise Shrine by boats in a convoy. in the northernmost Shinojima Island around 7:00a.m. 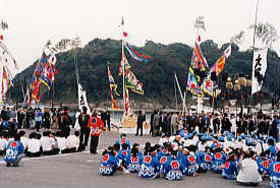 Local people lift a flag given from Ise Shrine, on which "太一御用 (which means Ise Shrine's order)" is written. 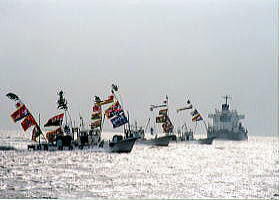 when they catch bream for the offering or while sailing to Ise Shrine with the dried ones. 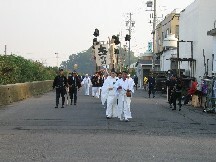 The procession starts Nakatejima at 7:00a.m. and arrives at Ichiba around 8:00a.m. 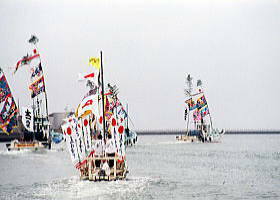 After the ceremony, boats with dried salt bream leave for Ise. 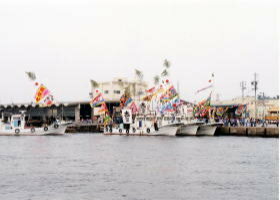 There are many events until the boats coming back. After they are coming back around 16:00, the last event mochinage starts. 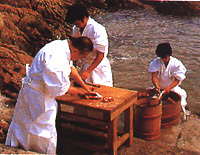 They offer dried salt breams three times a year for Ise Shrine.